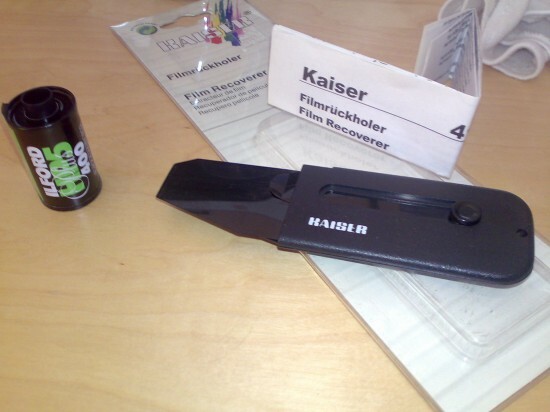 Item #4132: The Kaiser Film Recoverer. Please ignore the manual. So I bought this film retrieving device the other day. When film gets fully retracted into a 35mm cartridge, it’s a bit of a nightmare to get it out. I tend to pry it open with a screwdriver, but professionals seem to have a different tool. Available at Process Supplies for a mere £3, I couldn’t resist. Trouble is: the manual tells lies, or let’s just say it’s a bit sketchy, and by following the steps, the film doesn’t come out. Hold your film canister with the spool to the top and the slit opening to the left. That’s half the way to success already! Your film retriever has two tongues and a hard plastic back bit. Insert both tongues (the big one and the small one) into the spool. Do NOT insert the hard plastic bit. Wind the film counter-clockwise, until you hear a slight “tick” noise. That’s your film slipping off the small tongue. DO NOT move the knob on the retriever grip, despite what the manual tells you! Now, wind the film the other way (clockwise), until you feel a bit of resistance. The goal here is to slide the film under your small tongue. Insert the small tongue by moving the knob into position B (i.e. towards the film spool). This should now capture your film between the two tongues. You should hear some crackling noises in the film canister, indicating that the little hooks on the tongue slide over the sprocket holes. Sweet! Retract the grip from the film canister, and in an ideal world, some film should pop out. If you do it like the manual tells you, failure is guaranteed – which might have a serious impact on your creativity. That worked, I was getting close to binning it!